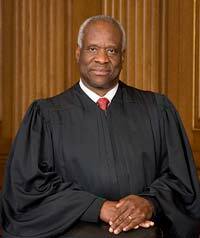 Clarence Thomas is the second African American Justice on the Supreme Court of the United States. He has become an icon of the conservative movement in the United States. Thomas was born on June 23rd, 1948 in Pin Point, GA. He would grow up in the Savannah, GA area in poverty. Thomas’ family lineage showed he was a descendant of slaves. He parents did work hard to provide for him and his siblings, but the low wages they earned made it very difficult for them to put food on the table. In a tragic event, the family home burned down and this led them to moving in with his maternal grandfather, Myers Anderson. Anderson was very strict and, later in life, Thomas pointed out that his grandfather was a hugely positive influence on him. His relationship with Anderson was chronicled in the autobiography My Grandfather’s Son. Thomas would go on to be an honor student in High School. He also attended two seminaries because he once wished to become a priest. His life goals would change and Thomas would veer down a very different path. He would major in English Literature at College of the Holy Cross and then enter Yale Law School. He graduated Yale in 1974. Thomas did not find landing a job with a law firm easy. He did face hiring discrimination issues, but he never let this deter him. Thomas would read the book Race and Economics by Thomas Sowell and this would have a profound impact on his thinking. He would become a huge fan of author Ayn Rand and this would further contribute to his strong libertarian beliefs. Yet, he still maintained conservative beliefs. Upon passing the bar exam, Thomas would go on to become an Assistant Attorney General of Missouri although he would leave to work in the private sector shortly thereafter. He did return to the public sector when he accepted a position as Legislative Assistant for energy issues with the Senate Commerce Committee. In 1981, his career would take a major turn when he served in the Reagan administration as Assistant Secretary of Education for the Office for Civil Rights in the Department of Education. He would then serve as Chairman of the US Equal Employment Opportunity Commission until 1990. He was nominated by Pres. George H.W. Bush to become a federal judge in 1989 and was appointed to the bench in March of 1990. First President Bush would nominate Thomas to the Supreme Court and formal confirmation hearings would start in September of 1991. Because of Thomas’ conservative leanings, the confirmation became a very partisan event. Even more troubling, there were issues raised about possible sexual harassment issues between Thomas and a colleague named Anita Hill. Thomas was eventually confirmed on October 15th, 1991. Thomas generally shuns the public spotlight and prefers to let his written opinions do most of his speaking for him.